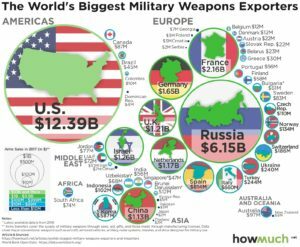 The larger a country appears, the more arms it imports or exports. 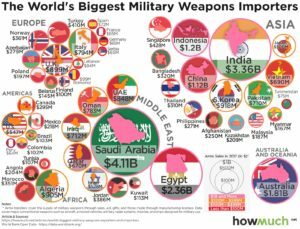 To understand the extent to which Americans dominate the international market for weapons, just look around the world. There are also lots of regional conflicts pressuring countries to spend top dollar for the latest military technologies. The world map of importers looks radically different from the exporters.